Accounting 303 Final Examination. Part I True-False (1 point each, 12 points total) If true, circle "T" on the answer sheet, if false, circle "F". Download "Accounting 303 Final Examination. Part I True-False (1 point each, 12 points total) If true, circle "T" on the answer sheet, if false, circle "F"." 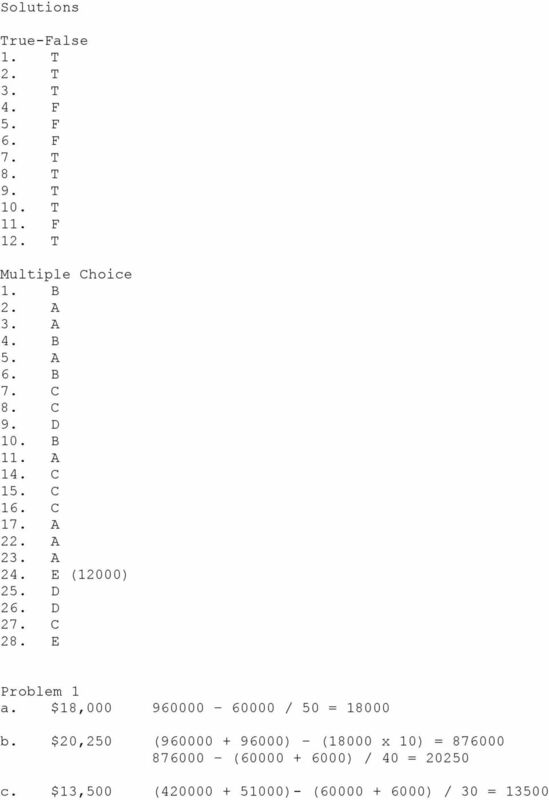 1 Accounting 303 Final Examination Name Part I True-False (1 point each, 12 points total) If true, circle "T" on the answer sheet, if false, circle "F". 1. The Financial Accounting Standards Board (FASB) is the rule-making body within the accounting profession which replaced the APB. 2. Under the matching principle, it is possible to have an expense reported on the income statement in one period, while the cash payment for that expense is reported in another period. 3. The economic entity assumption applies to all businesses, regardless of size. 4. Intraperiod tax allocation causes a reduction in income tax expenses for the period in which it is used. 5. An annuity requires that periodic rents (payments) always be the same even though the interval between rents may vary. 6. Advantages of a periodic inventory system include its easy, low-cost maintenance and ability to provide continuous, updated information on both inventory and cost of goods sold. 7. In a merchandising entity, cost of goods available for sale equals beginning inventory plus net purchases. 8. 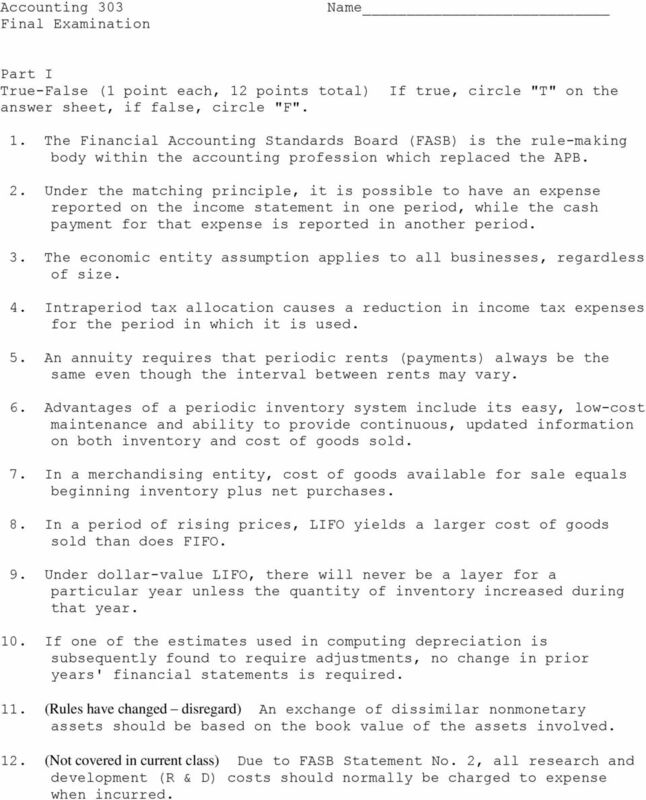 In a period of rising prices, LIFO yields a larger cost of goods sold than does FIFO. 9. Under dollar-value LIFO, there will never be a layer for a particular year unless the quantity of inventory increased during that year. 10. 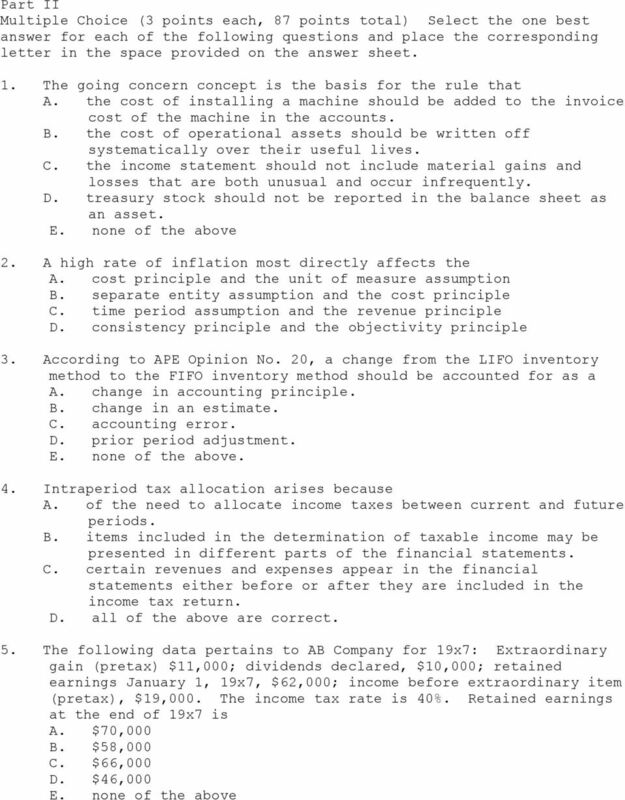 If one of the estimates used in computing depreciation is subsequently found to require adjustments, no change in prior years' financial statements is required. 11. (Rules have changed disregard) An exchange of dissimilar nonmonetary assets should be based on the book value of the assets involved. 12. (Not covered in current class) Due to FASB Statement No. 2, all research and development (R & D) costs should normally be charged to expense when incurred. 3 6. When depreciation is computed for partial periods under a decreasing charge depreciation method, it is necessary in the first year to A. charge a full year's depreciation in the year of acquisition to avoid allocation problems. B. determine depreciation expense for a full year and then prorate the expense between the periods involved. C. use the straight-line method for the year in which the asset is purchased. D. use a salvage value equal to the first year's partial depreciation charge. 7. Composite or group depreciation is a depreciation system whereby A. the years of useful life of the various assets in the group are added together and the total divided by the number of items. B. the cost of individual units within an asset group is charged to expense in the year a unit is retired from service. C. a straight-line rate is computed by dividing the total of the annual depreciation expense for all assets in the group by the total cost of the assets. D. the original cost of all items in a given group or class of assets is retained in the asset account, and the cost of replacement is charged to expense when they are acquired. 8. Goodwill A. generated internally should not be capitalized unless it is measured by an individual independent of the enterprise involved. B. is easily computed by assigning a value to the individual attributes which comprise its existence. C. represents a unique asset in that its value can only be identified with the business as a whole. D. exists in any company which has earnings that differ from those of a competitor. 9. At the end of two years, what will be the balance in a savings account paying 8% annually if $5,000 is deposited today? A. $5,000 B. $5,400 C. $5,800 D. $5,830 E. cannot be computed from the information given. 10. Ajax Company had a beginning inventory of $10,000. Its purchases for the period were $55,000, and Ajax averages 20 percent gross profit on its sales. For the period, its sales were $75,000. Therefore, its ending inventory can be estimated to be A. $10,000 B. $ 5,000 C. $ 8,750 D. $18,750 E. none of the above. 4 11. A company traded in a printing press with a book value of $1,300 and a market value of $1,500 for a used printing press that had a market value of $2,200. The press acquired was both larger and faster than the one exchanged. The company also paid $700 cash boot to make up for the difference in market value. What should be the capitalized value of the new asset? (Assume commercial substance) A. $2,200 B. $2,000 C. $1,500 D. $1,300 E. $1,000 F. none of the above. 14. On September 1, 19X1, a company borrowed cash and signed a one-year interest-bearing note on which both the principal and interest are payable on September 1, 19X2. 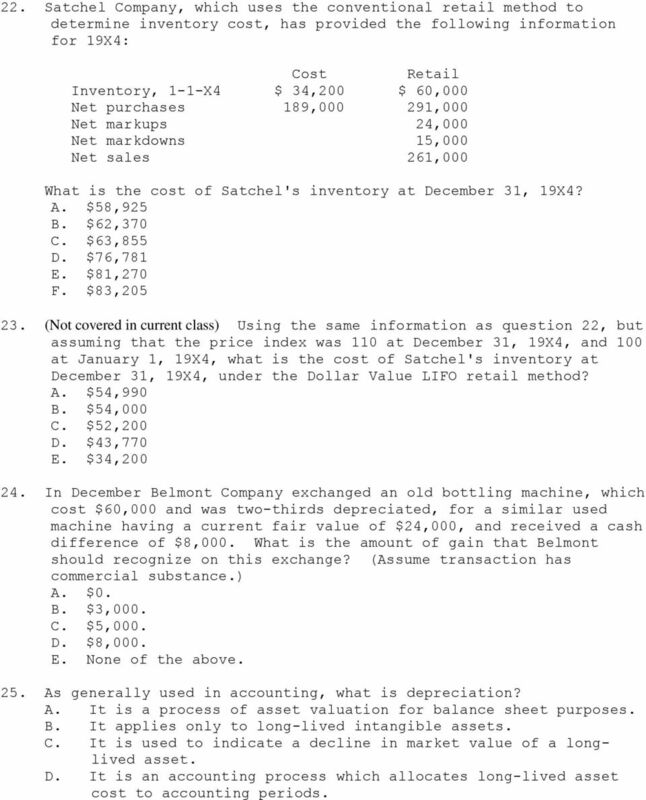 How will the note payable and the related interest be classified in the December 31, 19X1, balance sheet? Note Payable Accrued Interest A. Current liability Noncurrent liability B. Noncurrent liability Current liability C. Current liability Current liability D. Noncurrent liability No entry 15. In preparing its bank reconciliation for the month of March 19X3, Derby Company has available the following information: Balance per bank statement, 3-31-X3... $36,050 Deposit in transit, 3-31-X ,250 Outstanding checks, 3-31-X ,750 Credit erroneously recorded by the bank in Derby's account, 3-31-X What should be the correct balance of cash at March 31, 19X3? A. $35,250. B. $36,250. C. $36,300. D. $36,550. E. none of the above. 16. When the accounts receivable of a company are sold outright to a company which normally buys accounts receivable of other companies without recourse, the accounts receivable have been A. pledged. B. assigned. C. factored. D. collateralized. 17. When the allowance method of recognizing bad debt expense is used, the typical write-off of a specific customer's account A. has no effect on net income. B. decreases net income. C. decreases current assets. D. decreases working capital. 5 22. Satchel Company, which uses the conventional retail method to determine inventory cost, has provided the following information for 19X4: Cost Retail Inventory, 1-1-X4 $ 34,200 $ 60,000 Net purchases 189, ,000 Net markups 24,000 Net markdowns 15,000 Net sales 261,000 What is the cost of Satchel's inventory at December 31, 19X4? A. $58,925 B. $62,370 C. $63,855 D. $76,781 E. $81,270 F. $83, (Not covered in current class) Using the same information as question 22, but assuming that the price index was 110 at December 31, 19X4, and 100 at January 1, 19X4, what is the cost of Satchel's inventory at December 31, 19X4, under the Dollar Value LIFO retail method? A. $54,990 B. $54,000 C. $52,200 D. $43,770 E. $34, In December Belmont Company exchanged an old bottling machine, which cost $60,000 and was two-thirds depreciated, for a similar used machine having a current fair value of $24,000, and received a cash difference of $8,000. What is the amount of gain that Belmont should recognize on this exchange? (Assume transaction has commercial substance.) A. $0. B. $3,000. C. $5,000. D. $8,000. E. None of the above. 25. As generally used in accounting, what is depreciation? A. It is a process of asset valuation for balance sheet purposes. B. It applies only to long-lived intangible assets. C. It is used to indicate a decline in market value of a longlived asset. D. It is an accounting process which allocates long-lived asset cost to accounting periods. 7 Part III Problems (26 points) Work the following problems in the space provided and show all work. 1. 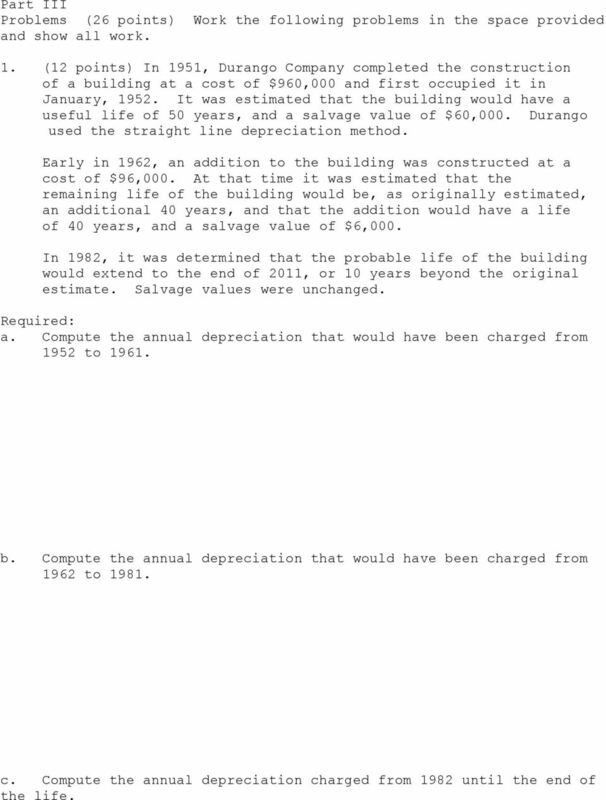 (12 points) In 1951, Durango Company completed the construction of a building at a cost of $960,000 and first occupied it in January, It was estimated that the building would have a useful life of 50 years, and a salvage value of $60,000. Durango used the straight line depreciation method. Early in 1962, an addition to the building was constructed at a cost of $96,000. At that time it was estimated that the remaining life of the building would be, as originally estimated, an additional 40 years, and that the addition would have a life of 40 years, and a salvage value of $6,000. In 1982, it was determined that the probable life of the building would extend to the end of 2011, or 10 years beyond the original estimate. Salvage values were unchanged. 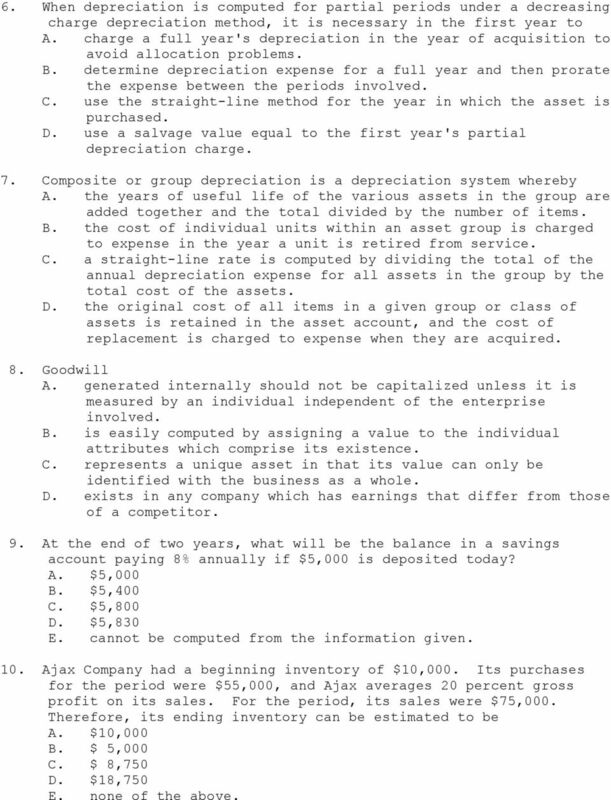 Required: a. Compute the annual depreciation that would have been charged from 1952 to b. Compute the annual depreciation that would have been charged from 1962 to c. Compute the annual depreciation charged from 1982 until the end of the life.